BB&T and Suntrust Bank recently announced plans for a merger. What does this mean for customers? Bank mergers are great for the banks, but generally, the customer pays the price of the merger both operationally and financially. 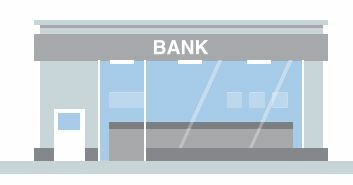 In the short run, you may lose your favorite banker or your local branch may close. Moreover, customers should NOT expect better pricing and lower fees on bank accounts, since a merged bank will typically have more market share, reducing the need to compete on rates. SIB Fixed Cost Reduction has a proven track record of significantly reducing our clients’ bank fees without changing banks. We lock in these rates and continually monitor our clients’ savings for several years — in this case, ensuring your newly negotiated rates stay in place throughout and beyond the merger. There is NO COST unless we save you money. Contact us if you’re interested in reducing your bank fees — regardless of who you bank with. CHARLESTON, SC (November 28, 2018) – SIB Fixed Cost Reduction announced today that it has acquired a stake in Santorian LLC, which helps organizations manage their legal invoices and identify overcharges and billing errors to assure they are receiving maximum value from their legal service providers. In addition, Santorian will be using SIB’s proprietary software, which employs OCR and Data Capture technology to streamline the collection and analysis of line item data from invoices. Santorian is now rebranded under the SIB umbrella as SIB Legal Bill Review. SIB Fixed Cost Reduction specializes in reducing recurring expenses for companies, regardless of industry, by negotiating best in class rates, rectifying billing errors and standardizing service levels with their clients’ current vendors. SIB bills only on the savings they are able to find with a 98 percent success rate at finding savings for its clients. Santorian protects its clients from being overbilled by outside law firms. The company actively manages and reviews all legal invoices and discusses its findings with the billing attorneys in an effort to reduce the charges to reflect the true value of the services rendered. This eliminates any potential awkwardness with clients having to question their outside counsel directly, while also reducing overall legal expenses. SIB Fixed Cost Reduction specializes in reducing companies’ recurring expenses. The company, which has grown to include offices in Charleston and New York, only bills based on the savings they find, and clients are not billed until savings are realized. SIB has analyzed over $3B in spend across more than 50,000 locations nationwide. This expertise across a variety of industries and audit categories allows SIB to effectively rectify billing errors and negotiate lower pricing for its clients without changing vendors or reducing service levels across dozens of spend categories, including telecom, utilities, waste removal, bank fees, maintenance contracts and more. For more information, visit www.aboutsib.com. Based in Philadelphia, SIB Legal Bill Review serves as an advocate for its clients by actively managing and reviewing their legal invoices to assure they are receiving maximum value from their legal service providers. The company then works directly with its clients’ billing attorneys to revise the charges to reflect the true value of the services rendered. Founder Joe Hopkins, Esq., has over four decades of experience as a highly respected attorney, employing a team of analysts who understand firsthand the systemic culture and method by which law firms bill their clients — and are well-versed in identifying charges that do not deliver corresponding value to the client. For more information, visit www.siblbr.com. CHARLESTON, SC (October 1, 2018) – SIB Fixed Cost Reduction announced today that finance industry veteran David Kelley has joined the company as its new Chief Financial Officer. In his new role, Kelley will be responsible for SIB’s overall financial and strategic management, including the company’s financial reporting, long-range business planning, accounting, tax, treasury and strategy across the organization. Prior to joining SIB, Kelley provided on-demand CFO services to technology and tech-enabled businesses at various growth stages and specialized in transformative and growth-oriented ventures. He has held senior leadership roles in private equity portfolio companies, family office ventures, publicly held businesses and foreign companies doing business in the US. SIB Fixed Cost Reduction specializes in reducing monthly expenses for companies with multiple locations. The company, which has grown to include offices in Charleston and New York, only bills based on the savings they find, and clients are not billed until savings are realized. SIB has analyzed over $3B in spend across more than 50,000 locations nationwide. This expertise across a variety of industries and spend categories allows SIB to effectively rectify billing errors and negotiate lower pricing for its clients without changing vendors or service levels across dozens of spend categories, including telecom, utilities, waste removal, bank fees, maintenance contracts and more. For more information, visit www.aboutsib.com. SIB Awards 5-Year $50,000 Bonus! 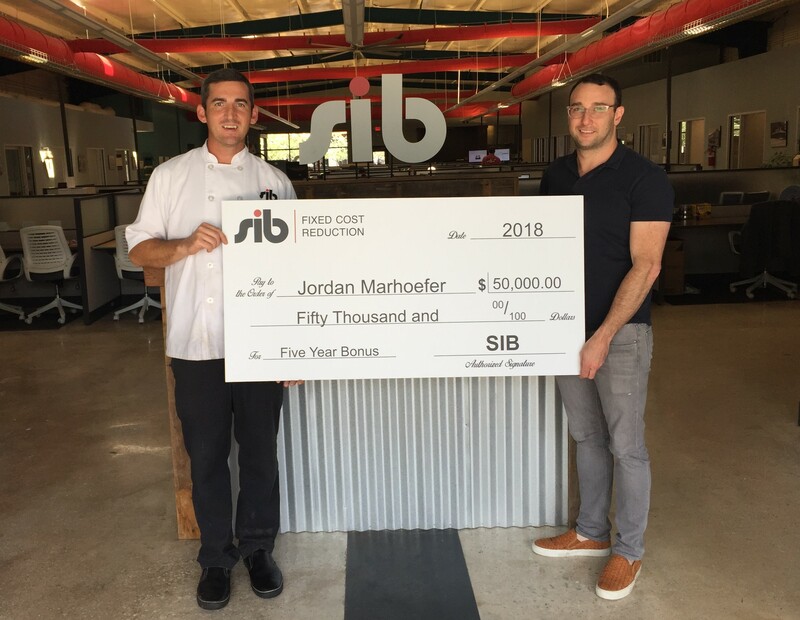 Congratulations to Jordan Marhoefer, SIB’s corporate chef, who just reached his 5-year milestone at SIB and earned a $50,000 bonus! SIB rewards each employee who reaches five years with this special bonus. The company is committed to team member growth and this special recognition recognizes our employees’ loyalty and hard work. US sanctions on crude oil may cause a swing in oil prices, according to industry analysts. What does this mean for you? Potentially higher fuel surcharges, shipping and transportation fees, and utility rates. SIB will work with your vendors to cap these charges and lock in your rates as the market fluctuates. With tax rate reductions starting in 2018, accelerating tax deductions into 2017 filings generates tremendous tax benefits. The corporate tax rate is dropping from 35% to 21%, so shifting tax deductions into 2017 creates permanent savings. There are numerous often-missed tax planning ideas to do this, including the §179D Energy Efficient Building Deduction and Cost Segregation. These planning ideas are typically outside the services provided by CPA firms, as they require special tools, professional credentials, and expertise. Any company with over $5M in building assets should consider these tax planning ideas. CONTACT US TODAY for a free analysis before your filing deadline. 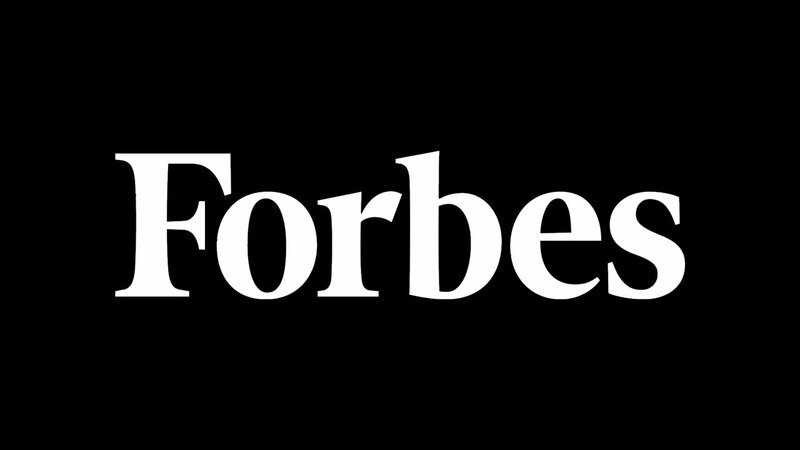 Dan Schneider, CEO of SIB Fixed Cost Reduction, is a regular contributor to Forbes. 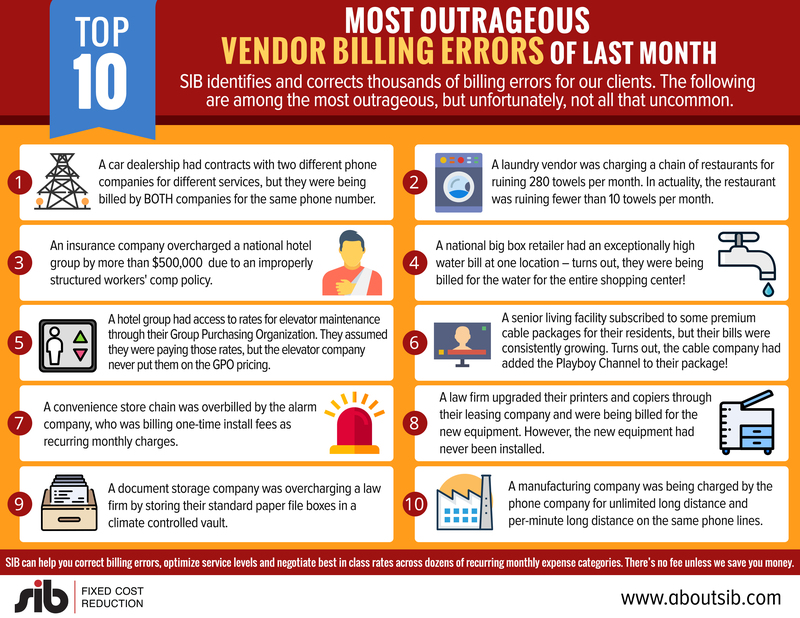 Most outrageous vendor billing errors from last month! 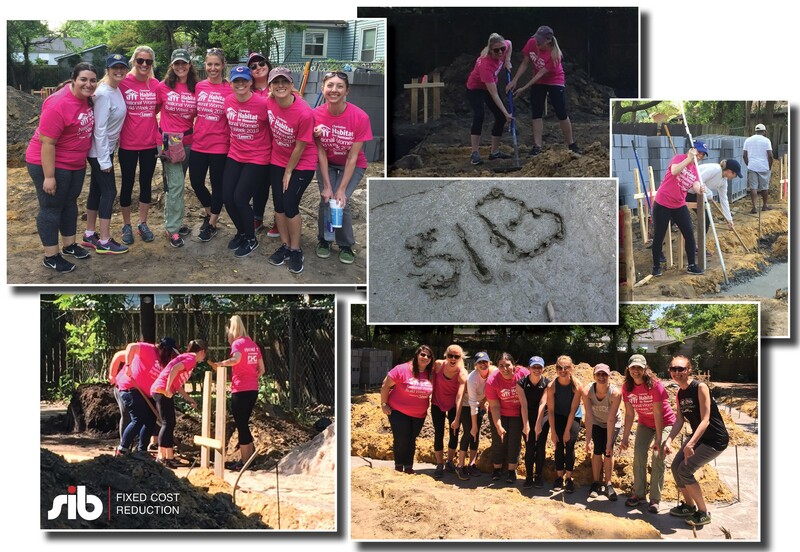 The ladies of SIB Fixed Cost Reduction were honored to participate in Habitat for Humanity’s National Women Build Week 2018, laying the foundation for what will become a beautiful home and an ongoing, rewarding way for us to continue to give back to our community. 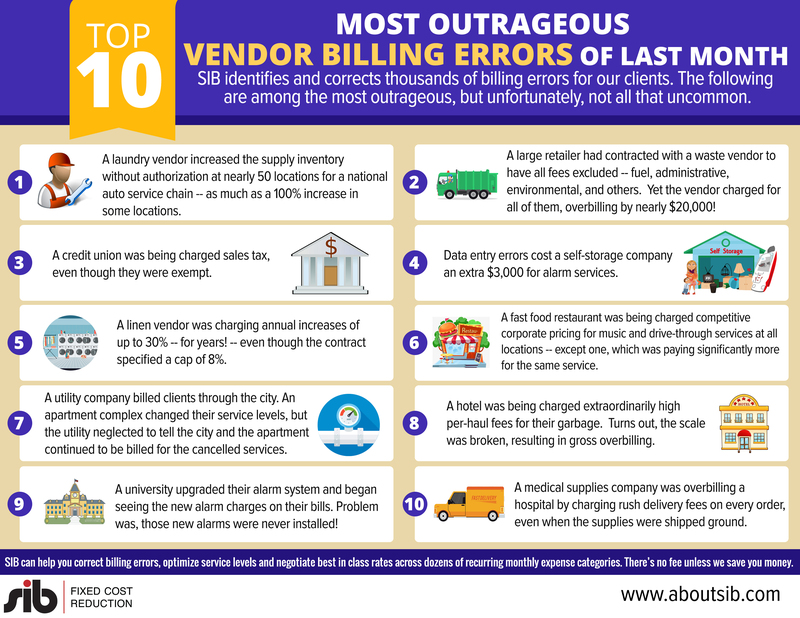 TOP 10 Vendor Billing Errors from April! Take a look at what our expert analysts uncovered – and corrected! – in April! 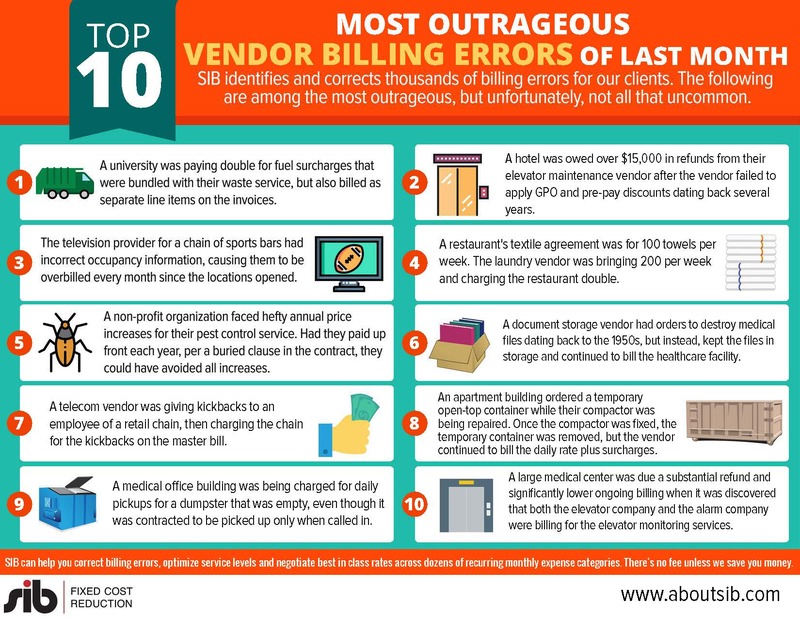 Top 10 Vendor Billing Errors of last month! SIB finds – and corrects! 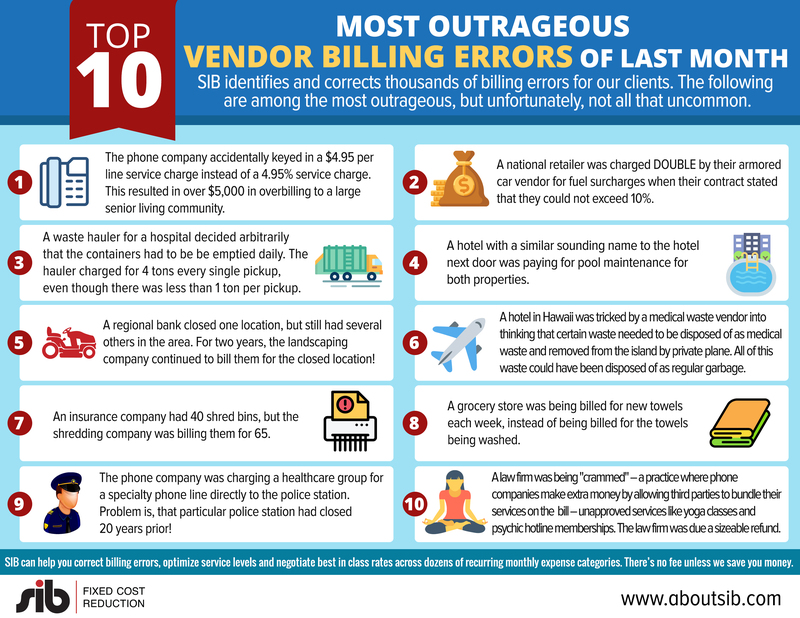 – dozens of crazy vendor shenanigans and ridiculous billing errors each month. Here are last month’s TOP 10! SIB Fixed Cost Reduction‘s own Darren Boulton and Dan Kaufman holding down fort at the Hunter Hotel Conference in Atlanta. Thanks to all the hotel owners and managers who stopped by! Next stop, Multi-Unit Franchising Conference in Las Vegas. CHARLESTON, SC (March 19, 2018) – SIB Fixed Cost Reduction announced today that it has hired financial industry insider Finley Horner as Director of Treasury Management. In this role, Horner will conduct all treasury reviews and work with SIB’s clients to negotiate and implement the most competitive bank fees on their behalf. Horner brings more than 25 years of industry experience working with Fortune 500 companies, providing strategic cash management and operational best practices expertise. He was most recently vice president of treasury sales for SunTrust Bank and prior to that, directed treasury services for PNC Bank, Fannie Mae, Capital One and Freddie Mac. SIB Fixed Cost Reduction was founded in 2008 and works with restaurant groups, hospitals, senior living facilities, universities, retail stores, Fortune 500 companies, and a host of other multiple-site organizations to analyze and reduce their fixed monthly costs. The company has grown to include offices in Charleston and New York. SIB Fixed Cost Reduction specializes in reducing monthly expenses for companies with multiple locations. Unlike other companies, SIB only bills based on the savings they find, and clients are not billed until savings are realized. SIB has analyzed over $3B in spend across more than 50,000 locations nationwide. This expertise across a variety of industries and audit categories allows SIB to effectively rectify billing errors and negotiate lower pricing for our clients without changing vendors or service levels across dozens of spend categories, including telecom, utilities, waste removal, bank fees, maintenance contracts, and more. For more information about SIB, visit www.AboutSIB.com. Christian Johnson & Bobby Brannigan (Mercato) chatting it up at the National Grocers Association Show 2018. Great time at the Mirage in Las Vegas with lots of good people and even better food samples! Also spotted in the front-right of this photo is Harold C. Lloyd’s latest book, Employee Retention Rules! Harold was kind enough to do a book signing at the SIB Fixed Cost Reduction booth. Thanks to Harold and all those who stopped by the booth. SIB awards 5-year $50,000 bonuses! Congratulations to Amy Sindall and Jamie Tuberty, who each just reached their 5-year milestone at SIB and earned their $50,000 bonus! SIB rewards each employee who reaches five years with this special bonus. The company is committed to team member growth and this special recognition and compensation recognizes our employees’ loyalty and hard work. CHARLESTON, SC (January 8, 2018) – SIB Fixed Cost Reduction announced today that it has hired talent management and coaching expert Richard Davis as Chief People Officer (CPO). In this role, Davis will develop and manage all corporate operations, including onboarding and talent development, goal-setting and alignment, and ongoing training initiatives. SIB Fixed Cost Reduction was founded in 2008 and works with restaurant groups, hospitals, senior living facilities, universities, retail stores, Fortune 500 companies, and a host of other multiple-site organizations to analyze and reduce their fixed monthly costs. The company has grown to include offices in Charleston and New York with employees across the globe. Davis has over 30 years of experience in executive management and consulting. He founded HirePowerHR in 1992, providing services to clients nationwide in numerous industries in human resources, talent management, performance management, management training, executive recruiting, and executive coaching. In 2007, HirePowerHR client Barnes Healthcare Services hired Davis to serve as Vice President of Human Resources and Customer Satisfaction. He also co-founded Paragon Ventures, LLC, a nationwide firm specializing in healthcare mergers and acquisitions. SIB Fixed Cost Reduction specializes in reducing monthly expenses for companies with multiple locations. Unlike other companies, SIB only bills based on the savings they find, and clients are not billed until savings are realized. SIB has analyzed over $2B in spend across more than 45,000 locations nationwide. This expertise across a variety of industries and audit categories allows SIB to effectively rectify billing errors and negotiate lower pricing for our clients without changing vendors or service levels across a variety of spend categories, including telecom, utilities, waste removal, bank fees, maintenance contracts, and more. For more information about SIB, visit www.AboutSIB.com. SIB celebrates 9 years of success with a holiday party at the American Theater in Charleston! CHARLESTON, SC (December 12, 2017) – SIB Fixed Cost Reduction is pleased to announce its strategic partnership with storelocal. Storelocal is a cooperative of self storage facility owners and operators collaborating to solve industry challenges, leverage new resources and improve their competitive advantage. Aligning with SIB will provide access to valued-added expense reduction services for storelocal co-op members. This partnership will enable storelocal members to leverage SIB’s experience at over 45,000 locations nationwide. SIB negotiates the lowest pricing and ensures the most favorable contract terms across spend categories such as waste removal, telecom, security contracts, maintenance contracts, property tax, utilities, credit card processing and more. SIB Fixed Cost Reduction specializes in reducing monthly expenses for companies with multiple locations. Unlike other companies, SIB only bills based on the savings they find, and clients are not billed until savings are realized. SIB has analyzed over $2B in spend across more than 45,000 locations nationwide. This expertise across a variety of industries and audit categories allows SIB to effectively rectify billing errors and negotiate lower pricing for our clients without changing vendors or service levels across a variety of spend categories, including telecom, utilities, waste removal, bank fees, maintenance contracts, and more. For more information about SIB, visit www.AboutSIB.com or call 843-576-3638. Storelocal is a cooperative of self storage owners and operators working together to solve industry challenges. Co-op members leverage existing and new resources to provide solutions for customer acquisition, operational services and technology products, thereby bridging the efficiency gap between the top national operators and online reservation systems. To learn more about the storelocal co-op, visit www.storelocal.com or call Bruce Heverly, Chief Marketing Officer, at 949-629-4142. $100,000 in bonuses awarded in October! Congratulations to Adam Fontaine and Ashton Webb, who each just reached their 5-year milestone at SIB and earned their $50,000 bonus! SIB rewards each employee who reaches 5 years with this special bonus. The company is committed to team member growth and this special recognition and compensation recognizes our employees’ loyalty and hard work. SIB CEO Dan Schneider presents $50,000 checks to Adam Fontaine (left) and Ashton Webb (right). SIB saves money for both Buffetts! SIB Fixed Cost Reduction has now saved money for both Buffetts! 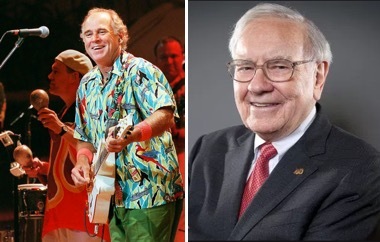 We have reduced monthly expenses for Margaritaville as well as multiple subsidiaries of Berkshire Hathaway. SIB congratulates Martin Summer (right) for five loyal years at SIB Fixed Cost Reduction. The reward for this milestone? A $50,000 bonus! SIB rewards each employee who reaches 5 years with this special bonus. SIB is committed to team member growth and this special recognition and compensation recognizes our employees’ loyalty and hard work. Are you being overcharged for PROPANE? Are you being overcharged for propane? Just like natural gas and other utilities, there are several invoice line items that add up to the final propane bill. SIB Fixed Cost Reduction reviews index pricing, delivery charges, storage charges, metering, maintenance contract fees, emergency calls, and even tank ownership versus leasing. Our commercial utility consultants know where to look to uncover opportunities to save money — in fact, we recently reduced monthly propane costs by 61% for one of our restaurant franchisees! CONTACT US for a review of your propane expenses or other spend areas like waste, telecom, property tax, employee benefits and much more! Between medical benefits, prescription programs, life insurance, disability and the management of it all, your total cost of employee benefits is substantial. In fact, companies are spending an average of $10,000 per employee annually for health and wellness programs. SIB provides a significant savings opportunity for our clients with no risk or upfront expense to you. We evaluate your existing benefits program so you’re paying for only the services you need and getting the best price. We analyze your plan to expose hidden fees or supplemental arrangements. We’re industry insiders with the competitive knowledge to optimize your management spend. We are not brokers and are therefore completely independent from the industry and free of any conflicts of interest. Our only goal is to SAVE YOU MONEY. To learn more about our cost reduction strategies for employee benefits, or other fixed monthly spend categories like waste, telecom, utilities, and maintenance contracts, please CONTACT US. CHARLESTON, SC (July 27, 2017) – SIB Fixed Cost Reduction announced today that it has hired technology veteran Stavros Aloizos as Chief Technology Officer. SIB Fixed Cost Reduction was founded in 2008 and works with restaurant groups, hospitals, senior living facilities, universities, retail stores, Fortune 500 companies, and a host of other multiple-site organizations to analyze and reduce their fixed monthly costs. In his new role at SIB, Aloizos will lead the company’s efforts to develop software tools to improve the client experience as well as to better leverage SIB’s extensive pricing data for vendor products and services for tens of thousands of business locations nationwide. Aloizos has over 30 years of experience creating innovative and disruptive technologies, has founded several successful companies, and holds multiple patents for large-scale algorithm-based applications. Prior to joining SIB, Stavros was the Founder and CTO of SoftWave Media Exchange (SWMX), which went public in 2006. More recently, Stavros was the Co-Founder and CTO of Border City Media and its BuzzAngle Music Products, which revolutionized the music industry by providing Big Data analytics on billions of transactions in real time. Stavros attended the University of Miami. SIB Partner Robert Handfield shares expert advice for writing good contracts. Click HERE for article. I have been having a lot of interesting discussions recently with both procurement and legal executives who are increasingly concerned with the state of their contract management processes. This is occurring for several reasons. 1. The exposure of many companies to greater risk is heightening the focus on contracts. 2. The need to write better statements of work (SOW’s) and Service Level Agreements (SLA’s) is recognized as key to improved outcomes. You get what you ask for. Don’t expect platinum service if you specified silver. 3. As Tom Linton stated in a recent Procurement Leaders interviews, PRICE = SPECIFICATION. You can directly throttle the price of a product or service by limiting it’s specification, or alternatively, prices can be allowed to escalate if proper specifications are not effectively collected and identified ahead of time. 4. Managers recognize that contracts, once written, become literally filed away until something bad happens. Contracts should instead be a living document, as things will change, and measurements need to be embedded in them that allow individuals to understand if the relationship is going on track or not. Of course, if you aren’t measuring something, than you have no leg to stand on if things go wrong and there’s nothing in the contract that says anything about how to handle unexpected issues. There should at least be an agreed on procedure to deal with unexpected surprises. 5. Litigation is escalating. More companies are seeing non-performance issues arise, and are going back to their contracts. Intellectual property is at the top of the list. It costs a lot more to get out of trouble once you’re in it, then to spend the time earlier and write a better contract. – Anticipate changes in needs or circumstances and decide how these will be addressed. If you’re reading this, then it’s safe to say that you’ve done alright with hotel asset management through the years. 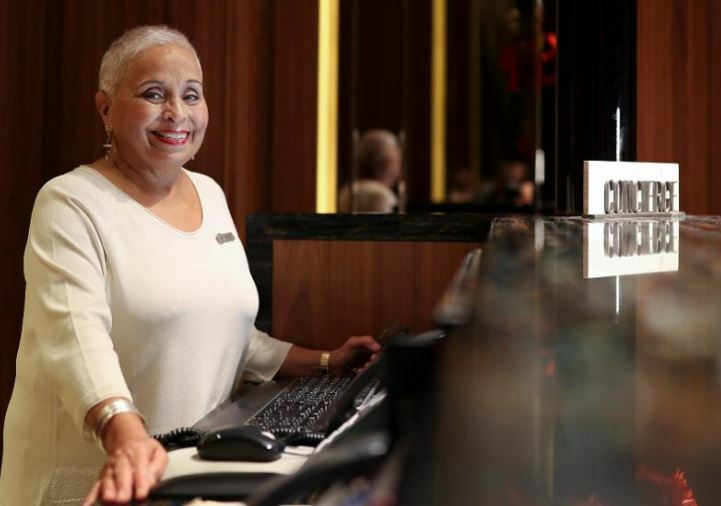 As the hospitality industry ushers in a predictable era of decelerating revenue increases, you understand that increasing net operating income (NOI) is the only surefire way to fight a flat-lining RevPAR and enhance asset values. But even the best players can’t win it all by themselves. There’s NOI in team. The harsh reality is that there are hidden expenses within all property management operating costs that can be reduced if organizations could only put the right people on the sidelines. There is hardly a company in the world that isn’t under continuous pressure to reduce or minimize costs while simultaneously striving for growth. Executives feel it. Purchasing departments feel it. Managers and even entry-level staff can feel it. The continual drive to do more with less has resulted in various techniques that look like good solutions, but they can be very difficult to accomplish, and at best only deliver a fraction of what a company’s total savings could be. You look at your balance sheet, ready to tear out your hair. There’s an old maxim in sales: “everything in life is negotiable.” Yet when business owners pair that concept with a phrase like “fixed costs,” it sounds like pitting an unstoppable force against an immoveable object. Fortunately for businesses that have seen their fixed costs inflate over the years, not all costs have to be so darn stubborn. If someone reached into your pocket, took out a wad of $20 bills, and ran away, you’d appropriately take immediate action and call the police. But what about the money your business loses every day? Sure, you can’t exactly call the police due to your business expenses, but these costs can represent bigger losses than mere increments of $20. For some businesses, hidden costs can be the difference between red and black ink. And if you know where to look for these hidden costs, you can take the “immediate action” you’ve been lacking every day at your office. Let’s identify some of the most common hidden costs we come across at SIB Fixed Cost Reduction. Have you heard that before? It’s the refrain of the frustrated business owner. In fact, you might have told yourself as much when reviewing your monthly expenses, wondering where all of the charges could possibly be coming from. Then, with great pain, you write the checks, sign them, and spend another month wishing you could only earn more money. But what if there was a simpler solution? What if you could simply reduce your expenses quickly? We’ll be the first to admit it: the word “audit” can be a little scary. 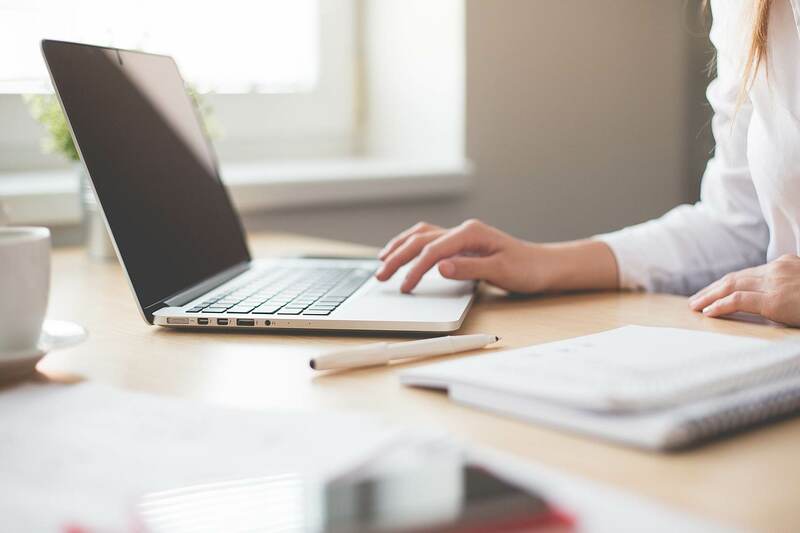 Fortunately, we’re talking about a business expense report audit: examining your outgoing money and bills to see where you can identify some savings and help improve your bottom line. There doesn’t have to be a single scary thing about it. Still not convinced? Okay, fine: let’s look through some of the most common positive discoveries we make when we at SIB Development work with companies to examine how they can save money on their business expenses.